Beautiful ethnic woman wearing sportive outfit and warming up legs standing on paved walkway of tropical shoreline. Homeless bearded male in hat and jacket sitting on pavement at sunset and begging for money. 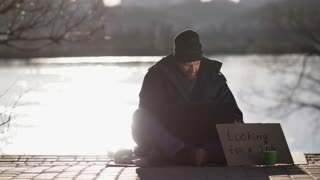 Mature beggar with cardboard sign using laptop and looking for a job. People's legs passing by.